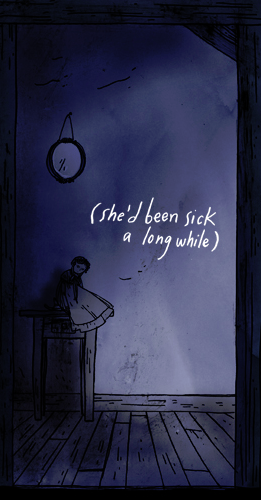 Emily Carroll’s comic, Margot’s Room, can be read both on a literal level (a man transforming into a werebeast) and on the metaphorical (the onset of depression and domestic abuse following the death of a child). Patterns and clues tend to emphasize narrative ambiguity rather than clearing it up. 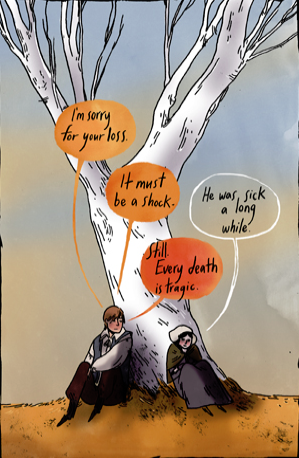 One of the main sources of confusion for me is the role of sickness in character deaths and transformations. Illness, and in fact, that exact phrase “sick for a long while” heralds another dramatic turn in the plot when Margot, their daughter, dies off screen. Up until this point, we see that sickness (particularly that of the “long while” variety) serves as a precursor to the rise and fall of relationships. The narrator’s relationship with her father appears to be stilted and perhaps estranged (in early panels, she mentions that the entire village shows up for the funeral, but no one approaches her or even attempts to find her). Her stoic reaction quickly transitions into bright scenes of her wedding (again, with no villagers in the background) with Gilles. The father’s illness, her own sickness are never mentioned again now that she has what she desires – attention, affection, and Gilles. Later, the narrator’s guilt that she is a failed and unsuitable mother is reflected in her statements that she “never thought” her daughter was like her (that in fact, Margot was so physically similar to her husband). This discomfort is linked to Margot’s “long” death, and the eventual destruction of the narrator’s marital peace. Finally, Gilles himself is described as changed and transformed, paralleling the deterioration of household peace.